This article was updated on 1.26.2019. Microsoft To-Do helps you manage, prioritize, and complete the most important things you need to achieve every day, powered by Office 365 integration. Now, with Cortana integration, you can save time and stay organized — Cortana helps by adding your reminders and tasks to your lists in Microsoft To-Do, so you can stay on top of what matters most. Use your voice, your PC, your phone — your choice. Streamline your tasks — your lists and reminders from across Microsoft To-Do, Cortana, and tasks in Outlook can now become one — centrally located in your Microsoft To-Do app. Use Microsoft To-Do anywhere: on your Android or iPhone, with Cortana, or on your Windows 10 PC. You can also access Microsoft To-Do from the web. It’s automatically synced so you never miss a beat. With this integration, we are furthering efforts to seamlessly sync your to-do lists across Microsoft To-Do, Cortana, and your Outlook tasks. Follow the quick steps below and give it a try. To share feedback, join the cohort or use the Feedback Hub. Your reminders and lists across Cortana, Microsoft To-Do and Outlook will start syncing. 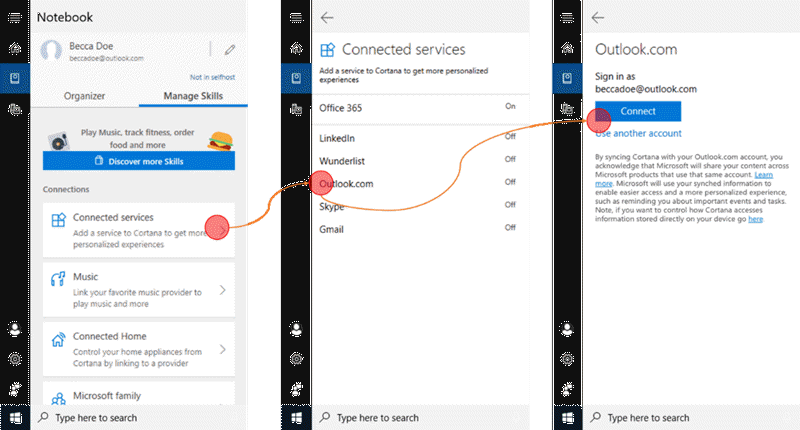 Then, sign into the Microsoft To-Do app or Outlook with the same personal or enterprise account you used earlier when setting up connected services in Cortana. All your reminders and lists will now be synced across Cortana, Microsoft To-Do and Outlook. Learn more about connected services in Cortana. Open the Microsoft To-Do app on your PC and create a new list titled “Travel”. Ask Cortana to add “Paris” to your “Travel” list. Verify if “Paris” was automatically added to your “Travel” list on Microsoft To-Do. Wait for the reminder. You should receive a Microsoft To-Do reminder, and a Cortana reminder. The reminder should appear both in your Microsoft To-Do planned tasks and your Cortana To-Do lists. In the Microsoft To-Do app and Cortana, you can also add a time reminder on any item in the lists. Go to the Microsoft To-Do app and click on Tasks. Create a new task and add to the Task list. Click on the new task to edit. Click on “Remind me” and set a reminder for later in the day. Try with other query patterns such as “What are my reminders in the evening?” etc. Works best when you disconnect Wunderlist from Cortana. Try disconnecting and setting up Outlook or Office 365 connected service again if Reminders and lists do not sync across Cortana, Microsoft To-Do and Outlook even after performing the steps described above. Location-based reminders can only be created in Cortana, while you can view them in your Microsoft To-Do app. Attachments added with Cortana are only accessible in Cortana (won’t sync to Microsoft To-Do). A list shared between multiple people in the Microsoft To-Do app will only appear in Cortana for the person who shared it. All members of the list can still access the list in Microsoft To-Do. You may see duplicate notifications for a single reminder — from Cortana, Microsoft To-Do, and Outlook apps on your Windows 10 PC or iOS phone. Learn how to change notification settings in Windows 10. You may see the Reminders app on iPhone triggering reminders set in Cortana. This typically happens if “Reminders” sync is turned on at Settings > Passwords and Accounts > Outlook. Turn off Reminders sync to prevent Reminder app from triggering Cortana reminders. Q: What markets is Cortana and Microsoft To-Do integration available? A: Cortana and To-Do integration is currently available in English language in 4 markets: US, UK, India and Australia. Q: What devices can I use to set up my sync across Cortana, Microsoft To-Do and Outlook apps? A: You can use a Windows 10 PC (version 1703 or above) or above or Cortana Mobile app (version 3.0 or above) to connect to Outlook or Office 365 accounts and set up the sync. Learn more about connected services in Cortana. Q: What devices can I use to add reminders and lists using Cortana and have these sync to Cortana and Microsoft To-Do? A: Once you have setup your accounts to sync with a Windows 10 PC, you can then use any Cortana enabled device — PC, Android or iPhone, or Harmon Kardon Invoke speaker — to add reminders and lists and get these synced across Cortana, Microsoft To-Do and Outlook. Q: What type of accounts I can use to setup Outlook or Office 365 connected service to sync reminders and lists across Cortana, Microsoft To-Do and Outlook? A: You can currently use either a personal Microsoft account (@Outlook.com, @Hotmail.com, @Live.com) or an Enterprise account to set up connected services. Be sure to login with the same account across all the apps to view and manage the reminders and lists. Learn more about connected services in Cortana. Q: Can I connect more than one Outlook or Office 365 connected service in Cortana? A: At this time, Cortana only supports one connected service within each service type (personal or enterprise). Learn more about connected services in Cortana. Q: Can I view reminders and lists from both Outlook and Office 365 connected services in Cortana? A: At this time, you will only be able to see reminders and lists either from an Outlook or Office 365 connected service, but not from both. Learn more about connected services in Cortana. Q: Once the Outlook or Office 365 connected account is set up, what are the other apps to which these reminders and lists created in Cortana can sync? A: At this time, after you have set up the Outlook or Office 365 connected service in Cortana, these reminders and lists sync across Cortana, Microsoft To-Do, and Outlook. Learn more about connected services in Cortana. Q: Will I get multiple notifications for the same reminder on Cortana, Outlook and Microsoft To-Do? A: You may see duplicate notifications for a single reminder – from Cortana, Microsoft To-Do, and Outlook apps on PC. Learn how to change notification settings in Windows 10. On iOS, both apps will trigger the reminder notification while on Android, only one app will trigger the reminder notification. Q: Can I sync Cortana reminders and lists to both Wunderlist and Microsoft To-Do? A: At this time, only Cortana lists can be sync’d to Wunderlist. To sync Cortana reminders and lists to Microsoft To-Do, you will need to manually disconnect any Wunderlist connected service and set up an Outlook or Office 365 connected service. Q: Will location reminders created in Cortana trigger in the Microsoft To-Do or Outlook apps? A: Location reminders will only trigger in the Cortana app. While you can create location reminders in Cortana and view them in the Microsoft To-Do app, creating and triggering location reminders in either Microsoft To-Do app or Outlook isn’t currently possible. Q: Which is the default list to add items in Cortana? A: By default, Cortana will add items to the Cortana “To Do” list unless the name of the list is explicitly specified. For example, if you add “clean the closet” to your list,” the items will sync to the “Tasks” list in Microsoft To-Do. Q: Can I view the photos attached to a Cortana reminder in the Microsoft To-Do app? A: At this time, any photo or other type of attachment you add to a Cortana reminder won’t sync to the Microsoft To-Do app, but you can still access them in Cortana. Q: How can I add a task or a list item directly to the “My Day” view in Microsoft To-Do app, using Cortana? A: At this time, Cortana cannot help you add or recall tasks from the Microsoft To-Do “My Day” view. Q: How do shared lists work between Cortana and the Microsoft To-Do app? A: A list shared between multiple people in the Microsoft To-Do app will currently only appear in Cortana for the person who shared it. Other users can still access the list in their Microsoft To-Do app. 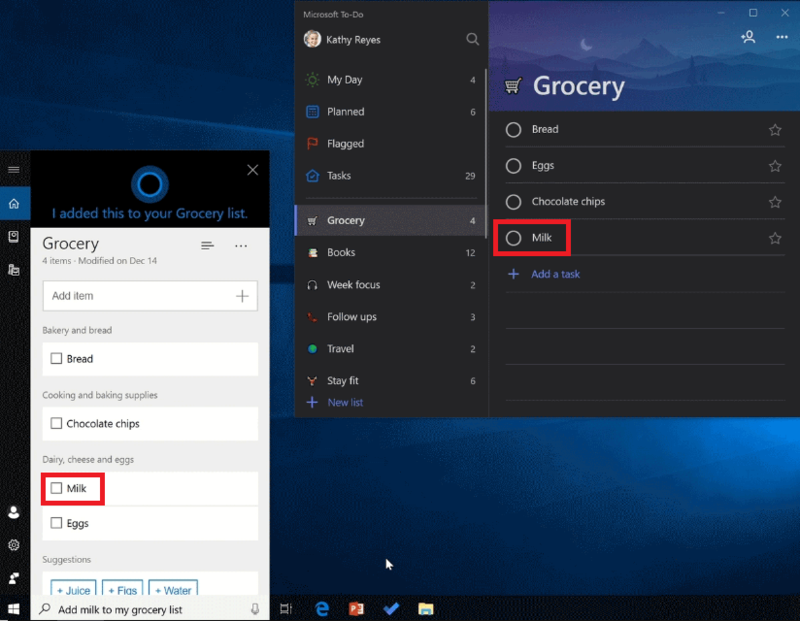 Q: How can I share lists using Cortana? A: At this time, you cannot share any list using Cortana.